This 2/2 furnished condo is perfect for all beach lovers who still want the comforts of home. On premise you will have a heated swimming pool, tennis courts, private balcony, lounge chairs on beach, and washer and dryer on property. Sanibel Island is famous for its beauty and magnificent sunsets. Premier Beaches, Fine Dining, and Sport Fishing! 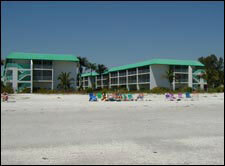 Siesta Condos are located on Sanibel Island with miles of white sandy beaches on the Gulf of Mexico. Located twenty miles from Fort Myers International Airport. $995.00 to 1295.00 a week.